President-elect Donald Trump’s presumptive electoral victory has led many individuals and organizations, including media outlets, to speculate whether the proliferation of fake news shared online during the campaign season made an impact on voters’ decisions. A report just last week was topping Google searches, stating that Donald Trump won the popular vote, when, in fact, recent numbers show Hillary Clinton leading. Other “news” websites have, at various points, posted articles on their Facebook pages claiming Megyn Kelly and George H.W. Bush were voting for Clinton (unverified), or made incorrect statements claiming Putin’s online troll factory was responsible for rigging online polls to show Trump won the first debate. Facebook and Google recently announced they are taking steps to keep ads off of fake news sites. But that doesn’t discount the disturbing trend toward sensationalized news, or downplay any role it may have played in the election, for either side. 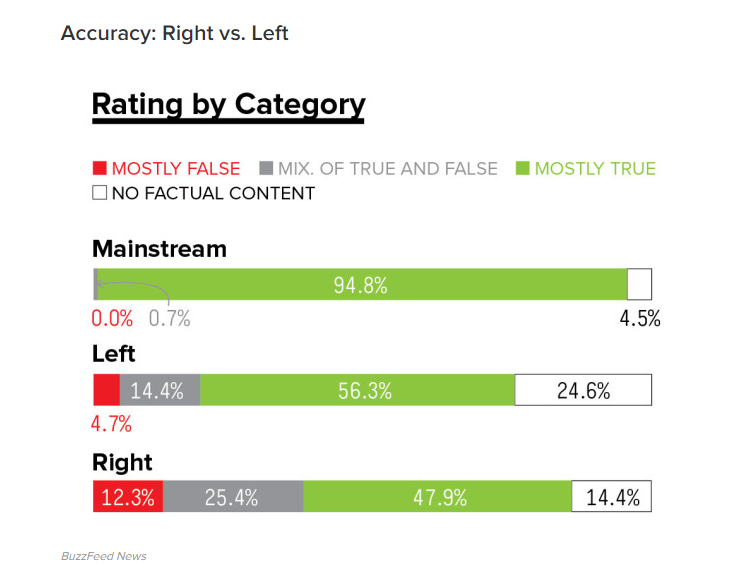 Other residents the Post spoke to said they may read the news, but that doesn’t mean they believe it—despite centrist news organizations like CNN, Politico and ABC News maintaining a 94.8 percent truth rating in a recent BuzzFeed News study. The analysis of hyper-partisan web pages concluded that, in contrast, three large left-wing pages published false or misleading information in nearly 20 percent of posts, while the three big right-wing Facebook pages published it 38 percent of the time. Screenshot of BuzzFeed News report. “The most interesting thing is that after a few days of fact-checking right-wing pages, my Google results started skewing to right-wing sites,” said one team member in the BuzzFeed report. In fact, completely alternate realities can be made by “liking” Facebook sites and clicking on their news, heightened by Facebook’s new algorithm, launched in early 2015, regarding news feeds. In response to the recent awareness of fake news, Merrimack College Assistant Professor Melissa Zimdars created a list of “False, Misleading, Clickbait-y and Satirical ‘News’ Sources,” cautioning the reader that not all of the pieces posted on the sites are mostly lies, but maintaining that many consistently do not provide appropriate context, or are often misleading in their presentation of facts. Or, in the cases of satire, some people click without realizing what they are reading was created for purposes of humor. Such websites include Breitbart, MSNBC.com, MegynKelly.us, the Onion (satire), the Borowitz Report (satire), Newsmax.com, Infowars.com, Occupy Democrats, Project Veritas, The Blaze and Endingthefed.com. With the growing awareness of fake news and the recent actions taken by Google and Facebook to mitigate the issue, one can hope that more will take care in selecting their news sources.